KitchenAid SodaStream Sparkling Beverage Maker has an average rating of 4.43 out of 5 based on 7 user reviews. 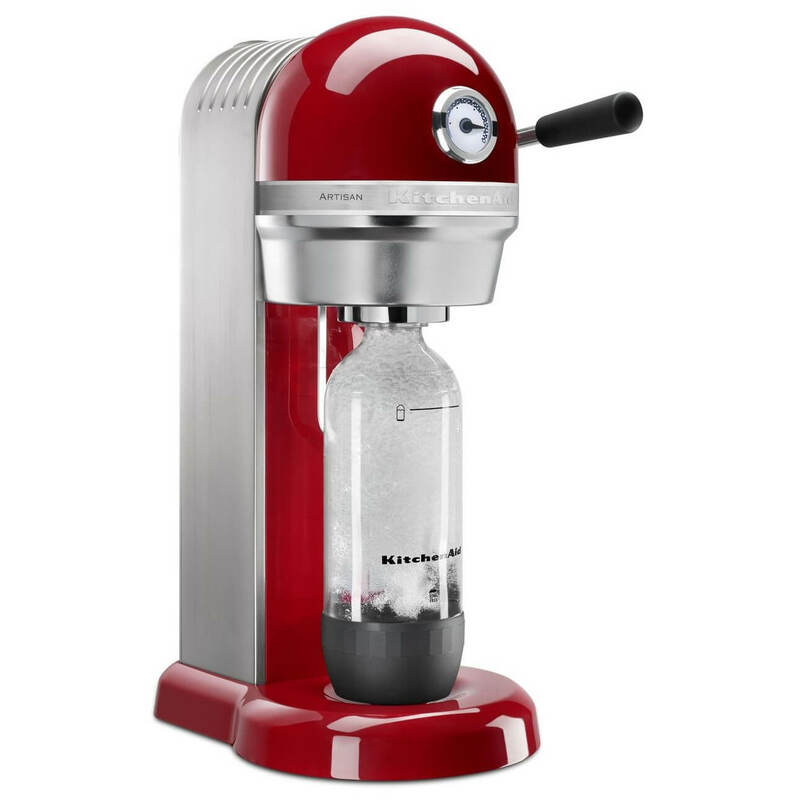 The KitchenAid Sparkling Beverage Maker is the highest quality soda maker available on the market and, despite being manufactured by KitchenAid, it still uses the SodaStream refill system. The Soda Maker Club Recommends it to those who want a very high quality machine that won’t fail them and that is still, at the same time, easy and efficient to use. The KitchenAid Sparkling Beverage Maker is very easy to use and efficient thanks to the snap-lock mechanism and the carbonation lever. Fill the carbonating bottle with water. Attach it to the soda maker with the snap-lock mechanism. Pulse the carbonation lever until the desired level is attained. Remove the bottle and pour. 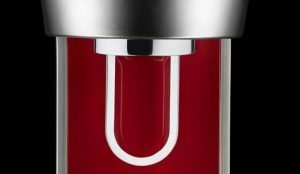 The KitchenAid Sparkling Beverage Maker uses 60L SodaStream carbonators that, as their name implies, allow for carbonation of roughly 60L of water (most users do however report around the 50L range). Empty carbonators can be exchanged for full ones at various retailers such as select Bed Bath & Beyond, Costco, Target, etc. To find a retailer close to you.. Every exchange costs $14.99 but there are cheaper, DIY options. 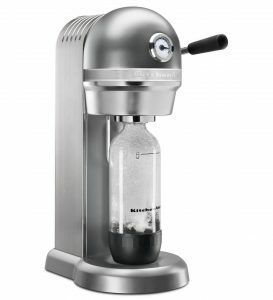 This KitchenAid SodaStream machine is a truly uniquely premium soda making machine that we highly recommend to those who are willing to pay its above average price. In fact, in the world of soda makers, products range from $15 to roughly $274, with this machine obviously being at the top of the spectrum. Now that the >$300 Keurig Kold has been discontinued, the only comparable soda machine in terms of price is the SodaStream Penguin (it’s hard to compare the two machines in terms of other characteristics as the latter is shaped as a penguin). So now that we’ve established that the KitchenAid Sparkling Beverage Maker is more expensive than other soda machines, the question remains: is it worth the price? Its premium characteristics definitely make a strong argument in favor of its purchase. The KitchenAid SodaStream machine is undoubtedly the most sturdy soda maker out there. Made out of metal, it is also manufactured in the United States and, weighing it at nearly 20 pounds, is a testament to good, durable and powerful American manufacturing. The quality of this machine is confirmed by the amazing reviews it has gotten from users with almost none of them having any issues with the machine while all of them appreciating its quality. Hence, if you buy this soda maker, it’s likely to be the last one you’ll ever need, justifying the high initial investment. And that’s not all, this KitchenAid SodaStream machine is among the easiest to use. In fact, it uses a snap-lock mechanism, meaning you just need to push the bottle into place and not twist it on as is the case for certain products. It also uses a unique lever to carbonate the water while most other soda makers have buttons that need to be pressed multiple times. It’s not a huge deal, but it’s slightly more satisfying to use which can add up after hundreds of uses. It also boasts a carbonation meter which can help you get the perfect level of carbonation for you each time. The KitchenAid Sparkling Beverage Maker really differentiates itself through its incredible quality and design. It is by far the sturdiest of any soda maker machines offered by any company (most of the others being made out of plastic while this Kitchenaid machine has a premium die cast metal housing). On top of that, it is manufactured in the United States unlike most other SodaStream models. It’s clear, with all these characteristics, that the KitchenAid SodaStream machine will last you a long time as proven by the great customer reviews the machine has gotten and the few issues users have encountered. As if that wasn’t enough, it’s easy to use thanks to the snap-lock mechanism and the carbonation lever, carbonates water quickly and looks great in modern kitchens. However, it is more expensive than almost all other soda makers, with only the now discontinued Keurig Kold being more expensive. At upwards of $200, you must really be ready to make an investment in this machine since there are plenty of other machines that will do the same job almost as well, at a fraction of the price (for example, the SodaStream Genesis has also gotten good reviews at only $90). Nonetheless, when not considering price, the KitchenAid Sparkling Beverage Maker is, in our opinion, the best overall soda maker machine on the market right now. No other soda makers come close to its durability and it’s easily on par with the best soda makers in term of ease of use and appearance. Thus, if you’re ready to pay the high upfront cost, this soda maker will pay for itself many times over the course of its lifetime. Just be sure it can fit on your counter! The KitchenAid SodaStream machine has gotten rave reviews from users that loved its durable feel, ease of use and its design. Even though some people cautioned that the machine is very big and could be loud while also encountering issues with chilled water, the vast majority of consumers really enjoyed their machine and found that it got the job done nearly perfectly. I like my soda real bubbly and am disappointed with the carbonation put out. Unless I chug it down right away, the fizz dissipates fast no matter what I try, like making sure the cap is tight. It seems like in a couple of hours the carbonation is gone. I can’t see that I am doing anything wrong, so I don’t recommend buying this. I tried the SodaStream, but got the feeling it was one of those products where they gouge you aftermarket: charge a low price upfront and then make their real profit on refills. We drink gallons of soda water at my house, so I got tired of paying $15 for a refill. You had to buy an adapter to use other CO2 tanks. My new KitchenAid carbonator will take a 20 oz paintball tank right out of the box. With this arrangement, the KitchenAid makes more financial sense, and that’s on top of the convenience of making your own quality sparkling water. This KitchenAid is a nice looking product that I keep ready to use on my kitchen countertop. It costs more than the SodaStream, but I took the chance because KitchenAid has a good reputation. However, I ran into problems after six months of daily use. KitchenAid customer service sent me to a website to schedule repair service. But my local service provider wouldn’t touch it! So KitchenAid sent a replacement, which works fine. I have to say I was pleased with KitchenAid’s customer service. Just be sure you fill out and return your 1-year warranty card with a new purchase, and you should have no trouble if there are problems. I like that the Kitchen Aid canister is made of metal. You can get alot of pressure building up, so you don’t want a plastic container blowing up in your face. It appears to be well-made overall, and everything works just as promised. Carbonating your water is easy and smooth. It comes with instructions, so keep them handy. I found that no matter how simple it looked, it’s a quicker learning curve to READ THE INSTRUCTIONS first. Now I can quickly carbonate whatever I need, and the fizz will last in the refrigerator for a long time if you keep the lid tight. More tips: Use only clean filtered water to prevent any clogging or unsightly mineral deposits. Use a glass with some ice instead of trying to drink straight from the bottle. Personally, I like to add a splash of pomegranate juice and then pour into a glass over ice. The fizz enhances the taste. I liked the first one I bought, so I wound up getting a second because I drink sparkling water every day at home and at work. I used to stock up on Pellegrino every time I went shopping. Having a soda maker is definitely the better way to go. You can control the level of carbonation to get just the fizziness you want. My only complaint is that I went for the 60L CO2 canister size, but don’t actually get 60 bottles of water out of it, so it is costing me more than I hoped. And the machine itself is higher in price than some comparable products. So is it worth it? Yes! It’s worth it just for your health if you’ve been drinking sugary sodas. But it would be nice if the big cartridges were cheaper. My family drinks sparkling soda all the time, so cost was getting too high. There were other problems, like a lot of flat soda going down the drain. The KitchenAid we bought can use a 120-liter CO2 cartridge, so it seemed right for us. My new KitchenAid carbonator will take a 20 oz paintball tank right out of the box. It might even handle a 24 oz, I just haven’t tried yet. With this arrangement, the KitchenAid makes more financial sense, and that’s on top of the convenience of making your own quality sparkling water. I like it! This machine seems well made, looks good, and is easy to use. People who love sparkling water but are counting their pennies will love that it not only is cheaper to make your own, but saves them gas money and time spent running to the store. I bought a 20 oz. CO2 paintball bottle and keep a spare handy so I don’t run out unexpectedly; too bad it can’t handle a 24 oz. or something bigger. I got my Sodastream machine first and liked it. So decided to buy the Kitchen Aid machine thinking it would last a lot longer and work better. I was disappointed, when I used them side by side and the Sodastream carbonates the water better, don’t know why. I used both machines at the same time and carbonating the same amount of time. The Sodastream does a better job. I tried 15 to 20 times, I put a new C02 bottle in the Kitchen Aid to make sure it had good presser. Did not change anything. I see now why you can find them used for sale. This is the fourth soda stream I have purchased. I thought the would be the last. Sadly to say, it’s broken.